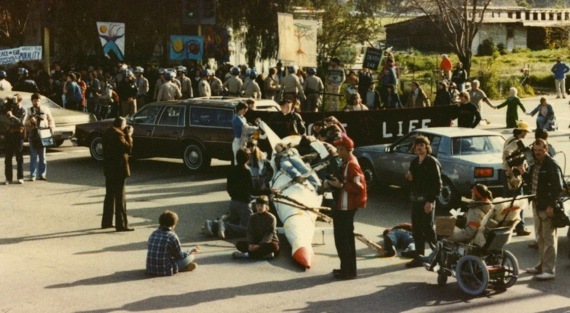 Spirit Affinity Group's action at Livermore National Laboratory in March, 1983. Courtesy of author. A longtime co-worker of mine became committed to nonviolence during a demonstration he attended many years ago as the movement to end France’s brutal war in Algeria was gearing up. In the midst of a chaotic scene in Paris, he saw a man sitting contemplatively in the street as a military vehicle bore down on him. Rather than running him over — as it seemed very likely just a moment before — the vehicle came to a stop. The driver then nudged the vehicle up to the demonstrator, coaxing him to get up. But he didn’t. This went on for a while, but the protester remained in his fixed position. Finally the driver gave up and swerved around the man, leaving him in the street. There are no guarantees with nonviolence. This scene could have ended very differently (as it did when I saw my friend, Vietnam veteran Brian Willson, run over by a Navy munitions train nearly 25 years ago during a protest against arms shipments to Central America). But this vignette from a half century ago unfolded as it did because this anonymous man in some unnamed French street had, as Thich Nhat Hanh puts it, become like a mountain: centered, poised, relentless. He didn’t rant. He didn’t run. He was here. He was now. And because of this, he transformed a highly mechanistic and objective operation (a military vehicle sweeping away an obstacle in its path to establish preeminence and to reestablish order) into a highly interpersonal and intersubjective one. Despite the roles each person had been assigned in this play, they engaged with one another in a way that was no longer found in the script. By being here and now, not only did the military vehicle relent — thus dramatizing concretely and symbolically an end to the military barrage being used by his nation to hold on to empire — it succeeded in irrevocably changing someone who was watching. Watching this simple, firm act managed to circumvent my friend’s deeply entrenched defenses and, in an instant, to reframe things. He understood for the first time that we have a power which had previously been only vague and theoretical. In these days of accelerating movement building, it is useful to reflect on the power of action that is centered, poised and relentless. Just as this long-ago scene on a Parisian street communicated a new way of being to my friend, so all nonviolent action is a form of communication, a specific type of discourse, designed to provoke a new kind of conversation with one’s larger society. Social movements change the world by changing the conversation. Injustice succeeds by monopolizing the chat, dominating the airways, laying down the law. Social movements rush headlong into history fueled by the conviction that such a one-way monologue is death. They are always dreaming up methods to muscle their way into the room, to pull up a chair, and to flick the discussion in a very different direction using a very different lingo. 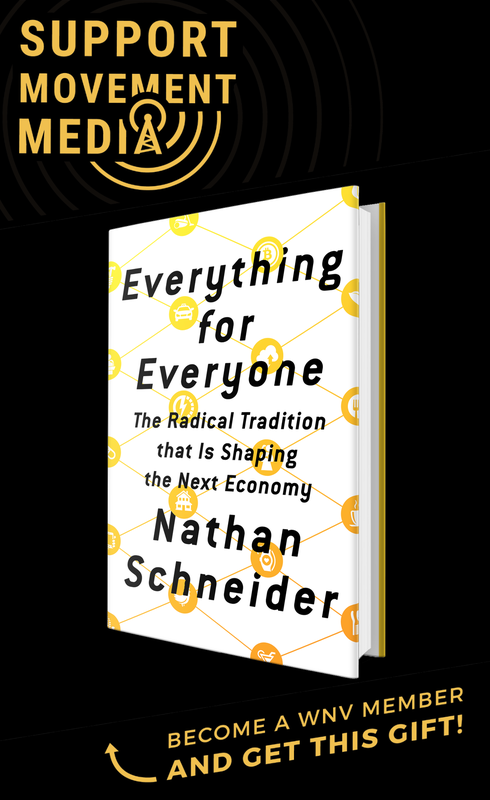 While injustice hinges on controlling the semantic universe to manufacture consent — so that money becomes speech and corporations become people — social movements succeed by crashing the party and challenging the chatter. They do this using the most powerful language we have at our disposal: the creaky, resilient and three-dimensional profundity of the human body — whether in Selma or Cairo or a forgotten street in Paris. Nonviolent action is about stoking a serious, jaw-dropping conversation with one’s society. As the late Bill Moyer’s book Doing Democracy stresses, the goal of a movement is not to convince the policy-maker to change. Instead, it is to alert, educate, win and mobilize the populace on whom the policy-maker depends for her or his power. The aim of nonviolent action is to spark and sustain a conversation with one’s larger society about grievances and their remedies. It seeks to pry open the doors of dialogue, so that whatever injustice we’re pitted against can be seen for what it is and we can finally all sit down and hash it out. The genius of nonviolent action is that it carries within its beating heart the capacity to slip past these defenses. Where violent action can often harden opposition and increase polarity, nonviolent action has the power to circumvent — and sometimes even to short-circuit — the willful knot of emotional and political obstacles a society erects to defend itself against transformation. No one action will create change, but each has an opportunity to advance the society-wide conversation on which change will ultimately rest. At least three dimensions of nonviolent action help to do this: vulnerability, creativity and a commitment to the larger good. The more these are expressed, the greater the potential that a given action will reach a society’s soul, or at least its “right brain.” The language of bodies in action — vulnerable, creative and implicitly desiring the good of all — speaks to us in a peculiarly poignant and clear way. Over the years I have seen this embodied power in action. I have seen people bring their deepest selves to critically important conversations, delivering their piece of the truth in person and in public: at federal buildings, at weapons facilities, in the streets, in the public square. Not always, but often, they have changed the atmosphere, opened possibilities that weren’t there before and extended a conversation that seemed stuck. Sometimes creating embodied power is a conscious process: remembering to breathe, recalling why we are taking action, walking with intentionality and purpose, anchoring ourselves in our heart and our deepest longing, noticing what we are feeling. In nonviolent action trainings, I invite people to choose six words that capture why they are taking this step, a phrase to which they can return again and again during the action. Other times this power comes from the form of the action itself. For example, for many years I participated in “die-ins” to symbolize the destruction that various policies mete out. Being horizontal and silent and immobile in this way induced a focused, contemplative intentionality. As noted before, there is no guarantee that nonviolent action will always have such happy outcomes. (A police officer broke the wrist of my friend David Hartsough under similar circumstances, and of course many others have paid much more dearly than this.) But nonviolent action bears within its vision and method the potential for transforming the intractable in small and large ways, for helping to break the spell of violence and injustice, just as the two of us in front of a weapons laboratory were momentarily transformed. Nonviolent action invites us to bring our deepest self to a heart-to-heart with those we encounter in the messy chaos of the action itself and with our larger society. And it invites us to do this through the irreducible plenitude and power of our bodies, creatively risking a little or a lot for the well being of this suffering world. Thanks Ken for reminding us how nonviolent action works. It engages in conversation in a much deeper way than shouting or throwing objects at the police or the establishment.